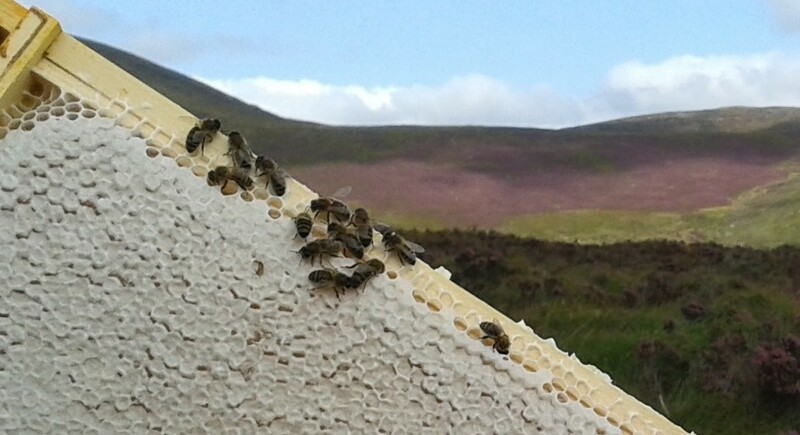 Heather honey is much sought-after (lovely heather honey recipe here) and commands a great price but to get a crop is not easy so the beekeeper needs to know about the Known Unknowns and Known Knowns. Not to mention the Unknown Unknowns. Even if the heather does yield – the weather in the hills at the end of summer can be flakey too. There are also factors he doesn’t know he doesn’t know about. Heather is just part of a complex ecosystem consisting of all sorts of things you might not have heard of, some or all of which may have profound effects on the honey flow or lack or it. Click here for more on the Calluna vulgaris ecosystem. Lowland sites vs Upland sites. Queens need to be young – preferably mated in June of the same year. Such queens will be just building up and will expand the brood nest in response to a flow and honey will be readily packed into the super. This expansion of the brood nest will also provide the colony with a strong, young cohort of workers to take them through the winter. Older queens, even one-year olds, may have been laying since March and are tired. Their brood nests will be contracting and the workers will be getting ready for winter; any heather honey brought in will be packed into the brood box rather than up in the super. Bringing in a crop of heather honey will also deplete the winter bees and the colony under a tired queen will not be able to replace them. This is probably behind the notion that heather honey is bad for winter bees. Commercial boxes are too big for Irish conditions and you will almost certainly find most of your heather crop downstairs in that enormous brood box. Don’t be greedy. Only put one super on at a time. If you put two on, not only are you asking for more than you are likely to get but also you are putting a great big draughty attic above the bees when what they need is warmth to draw that lovely white heather wax. And you do want your honey capped don’t you? If there is a huge flow you can always add another super later. Polystyrene hives have advantages and they have disadvantages but for the heather they’re perfect because they are so warm. This is important because it can be cold in the hills and the bees need warmth to draw wax and ripen the honey. More on hives and materials here. Feed the bees really well for heather – you want them stuffed to the gunwales. Remember they can be up in the hills for up to 6 weeks and it might rain for the duration. I’ve known this to happen and brought them back pitifully light, with no brood at all and not a grain of pollen. So give them 2 gallons of strong syrup or 7 litres of Ambrosia or other beefeed before you put the supers on. That way they will pack it down into the brood chamber filling every cell so if there’s heather then it has nowhere to go except upstairs. Whether you feed them at home before you take them to the hills or take them to the hills and feed them up there is entirely up to you – it’s as broad as it is long. That said – if it turns cold in the hills – and it often does – they probably won’t take their lovely syrup down. Best feed them as soon as possible after removing your summer honey. You shouldn’t need a queen excluder – especially if you have fed them well and the bees have a good arc of honey across the top of the brood nest – the queen will be unlikely to cross this barrier unless seriously disturbed. Instead, spread a square of plastic film/polythene across the top bars of the brood box leaving about an inch all the way round. This will give the bees free access to the super and the queen is unlikely to come up round the edges. If you are uneasy or jinxed put the excluder on – it just doesn’t give the bees such easy access and they may be reluctant to go up into the supers. In which case remove it till they go up then replace it – make sure the queen is downstairs or you’ll be spitting fire. Use unwired thin foundation for cut-comb honey but trim off a half inch strip so there is a gap above the bottom bars of the frame. This ultra-thin foundation stretches in the heat of the hive and if you don’t trim it, it will buckle where it comes up against the bottom bars of the frames and you’ll have an unsightly pleat in your lovely honeycomb. You can use wired foundation if you like, or just put your summer supers on straight after extraction. However, you won’t be able to extract it and will either have to cut the comb and wires from the frames or scrape the honey off the midrib with one of those sturdy scrapers for taking the ice of windscreens and then shove the lot through a heather press. Either way – it’s a terrible waste – good, drawn supers are valuable. Another alternative is to simply give the bees a 1 or 2 inch starter strip of foundation. If there is a flow, they will draw comb down from these. If there isn’t – nothing is lost. However, they will be burning precious heather honey to make more wax so if you give them foundation of some description – again you are maximising your potential honey crop. There are two sorts of heather sites – Upland and Lowland. Upland sites are up there in the hills where the bees have their feet in the heather. The first obvious advantage is that they are right there in the crop. The second advantage is that the higher up they are the more pure your crop is likely to be and the less likely you are to get ivy, late blackberry or fireweed mixed in with your crop. Pure heather honey is beautiful beyond compare and furthermore – it doesn’t granulate so is perfect for cut comb. There are disadvantages though. The weather can be very bad up there – windy and wet – and bee-casualties are high. Such sites are seasonal and as such you are faced with moving bees all at once at the end of the summer when you are probably running out of energy and may have to cope with your main summer honey crop all at the same time. There is a lot of work involved in moving bees – especially if you want to do it properly. Lowland sites are (obviously) sited down the hill in the balmier conditions but within reach of the heather. They have the advantage that they can be used the whole summer long so you can be getting your bees ready for the heather without having to move them. However, if the blackberry is late and/or the ivy is early you will not get a pure crop. Lowland sites can be much warmer and sheltered so the bees might get up earlier in the morning and work later but they are almost certainly going to have further to fly – however, it’s all downhill on the home flight. The other type of lowland site is bog heather. I have to confess I don’t know much about bog heather honey but it is almost certainly less pure than hill heather and will contain bell heather (Erica spp.) as well as Calluna. Also, bog heather is even flakier than hill heather. More of this in the upcoming piece on heather ecology. Upland sites are difficult: they are hard to find, access can be challenging, security can be a problem and bees need to be moved. Lowland sites are easier in all respects but the honey is less likely to be pure. We’ve covered the Known Unknowns and Known Knowns but to really get to the bottom of heather you need to know about the Unknown Unknowns – click here for Heather Ecology and the Unknown Unknowns.